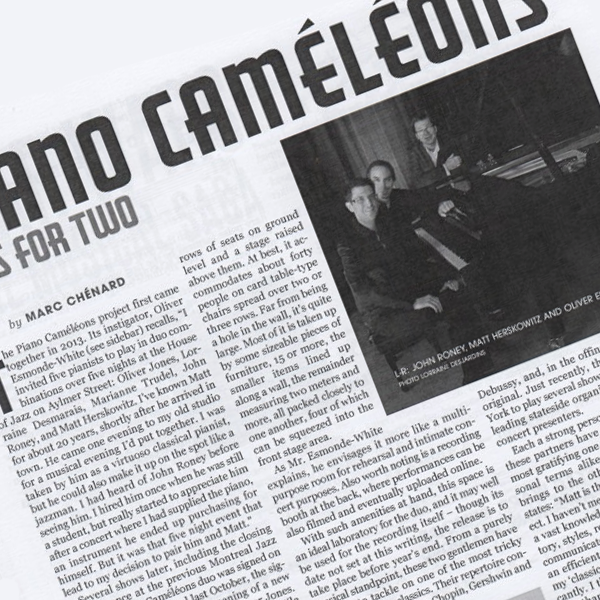 Several shows later, including the closing performance at the previous Montreal Jazz Fest, the Piano Caméléons duo was signed on to the Justin Time label last October, the signature coinciding with the opening of a new performance space: the Espace Oliver Jones. Located in the industrial sector of the Mile End district, the room is tucked away in one of the area’s office buildings. Finding it is not easy, because there is no sign at the entrance. The room is not a concert hall as such with rows of seats on ground level and a stage raised above them. At best, it accommodates about forty people on card table-type chairs spread over two or three rows. Far from being a hole in the wall, it’s quite large. Most of it is taken up by some sizeable pieces of furniture, 15 or more, the smaller items lined up along a wall, the remainder measuring two meters and more, all packed closely to one another, four of which can be squeezed into the front stage area. As Mr. Esmonde-White explains, he envisages it more like a multi-purpose room for rehearsal and intimate concert purposes. Also worth noting is a recording booth at the back, where performances can be also filmed and eventually uploaded online. With such amenities at hand, this space is an ideal laboratory for the duo, and it may well be used for the recording itself – though its date not set at this writing, the release is to take place before year’s end. From a purely musical standpoint, these two gentlemen have decided to tackle on one of the most tricky tasks: to jazz the classics. Their repertoire consists of staples by Bach, Chopin, Gershwin and Debussy, and, in the offing, a co-composed original. Just recently, they headed to New York to play several showcases at the APAP, a leading stateside organization of agents and concert presenters. In the early seventies, Oliver Esmonde-White saw the writing on the wall: as a French hornist, his future would be that of an orchestra player. Period. In a recent conversation at his workplace, he expatiates, “I’ve always sought out new challenges, that’s my nature, so spending the rest of life playing those same notes all the time in this or that symphony was not for me.” He then turned to the piano, which at the time was still the most popular instrument around, much unlike now, in his estimation. Starting as an apprentice with the Place des Arts piano technician, he opened up his business, Pianos EW, in 1974. Further training would follow, first at Baldwin and, later on, at Yamaha in Japan, a most special experience for him as first Westerner ever to be trained there.